You guys, let's talk about shrubs. No, not the bushes. The drinking vinegars. I'd been seeing shrubs on fancy cocktail menus for years, and I was always in awe of them, like, ooh, a shrub, but really shrubs are very simple. There are lots of different techniques for making shrubs, and lots of debate about which technique is the best, but all shrubs have the same three main ingredients: fruit, sugar, and vinegar. That's it. A glass of seltzer water and tasty, tasty strawberry shrub. Initially, the idea of mixing fruit with vinegar might seem a bit strange. The art of making shrubs arose out of necessity: pairing fruit with vinegar is a great way to preserve it, and adding sugar to the mix is a great way to make that fruity vinegar palatable. Shrubs were very popular in colonial times as a way of preserving that ripe fruit flavor without the aid of refrigeration, although the history of vinegar-based drinks goes back much farther: both the Babylonians and the Romans enjoyed drinks made from vinegar mixed with water. The word shrub comes from the Arabic 'sharbah', which means 'drink', and also gives us 'syrup' and 'sherbet'. The more you know! Now that I think about it it's weird that I didn't get into shrubs sooner, because I love the taste of vinegar, and I love drinking. But when I finally began experimenting with shrubs, earlier this summer, I got really really into it, as if to make up for lost time. I made a strawberry shrub (excellent), a sour cherry shrub (just ok), a tomato basil shrub (weirdly delicious), a sugar plum shrub (so tasty), and a honeydew shrub (which I actually don't like at all but might be coming around to). Although my process varies a bit from shrub to shrub, here's the one I've used the most, which comes from Food52. It's really very simple, and would work for pretty much any kind of fruit (or veggie) - the sky's the limit. Cover a pound of chopped or sliced fruit with two cups of sugar in a glass bowl. You'll want to alternate layers of fruit and sugar, and moosh the whole thing up a bit as you go, which will encourage the fruit to release its juices. Cover the bowl and let it sit for two days, or until the sugar has completely melted into a fruity syrup. (Stirring a bit will help to encourage this.) This is called a 'cold processsed' shrub - in this case, the sugar helps to draw out the flavor of the fruit, so you get a nice, richly flavored syrup. Once all the sugar has melted, the fruit will look a little like this, floating in delicious goo. 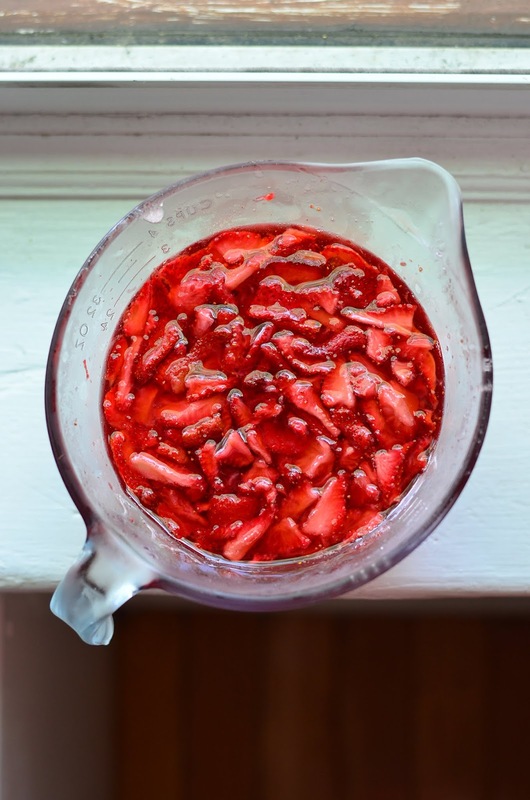 You can create all kinds of flavors by mixing up different kinds of fruits and sugars and vinegars - for the strawberry shrub, I used white sugar and red wine vinegar, with a touch of balsamic. For the sugar plum shrub, I used brown sugar and cider vinegar. Food52 has all sorts of suggestions, all of which I am of course dying to try. 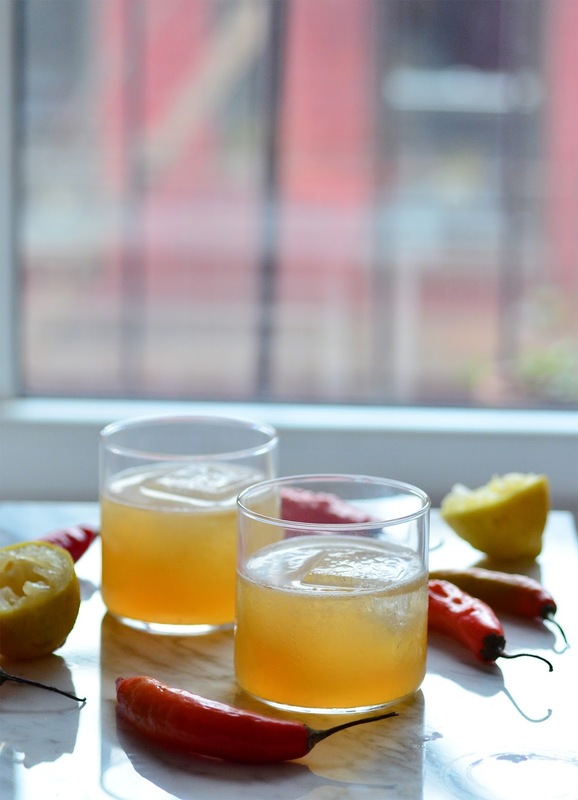 Once you've made your shrub, how do you drink it? This is weird to say, since this is supposed to be a blog about alcohol, but one of my favorite ways to drink shrub is with a little bit of soda water. (Of course, you can also drink shrub on its own, although most people (including me) find the flavor to be a little too powerful.) Strawberry shrub, I've found, is really nice with a dry rosé. And of course, I've been experimenting with mixing it into cocktails, which was really the whole point of making shrubs to begin with. If you follow me on the Instagram (which you should! 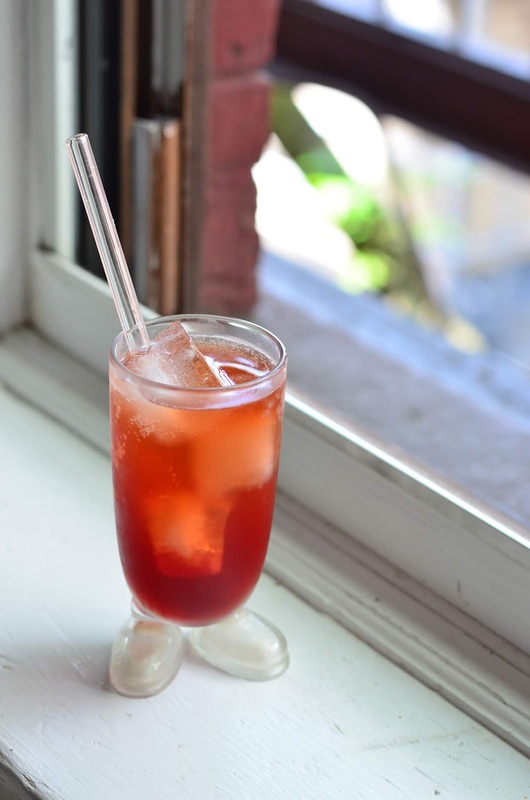 ), expect to see a whole whole lot more drinks made with shrubs. Shrub. I have a confession to make: until a few months ago, I had never made a cocktail with egg white. 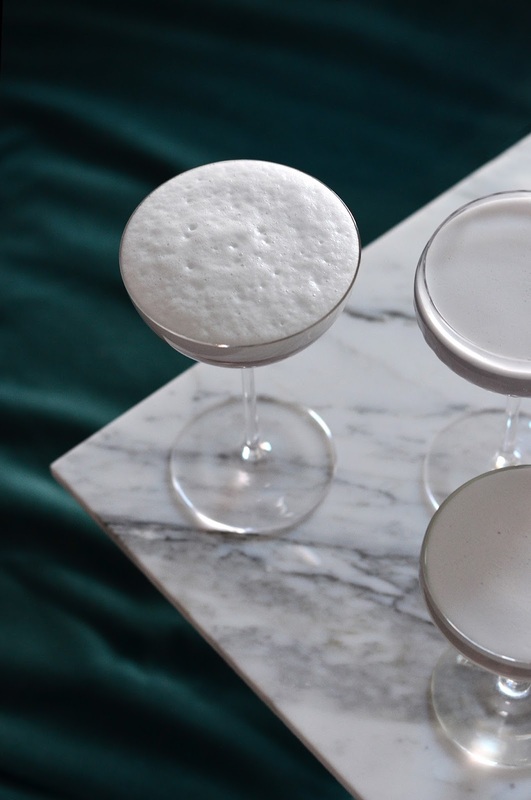 Apartment Therapy had an "Around the World" themed happy hour, and I volunteered to make Pisco Sours (for Peru, naturally) without thinking that I might be in a little over my head. Fortunately, my Pisco Sours (pisco, lemon, simple syrup, egg white, angostura bitters) turned out beautifully despite my lack of experience. This was mostly thanks to the Egg Beaters eggs whites I used, which, despite the name, do originate from actual eggs. They just come in a carton, not a shell, which is perfect if you want to make 50 drinks at a time, or you're just really lazy. The Egg Beaters egg whites don't need a great deal of convincing to produce a nice, creamy foam. With traditional egg whites, though, you're going to have to work a little harder. 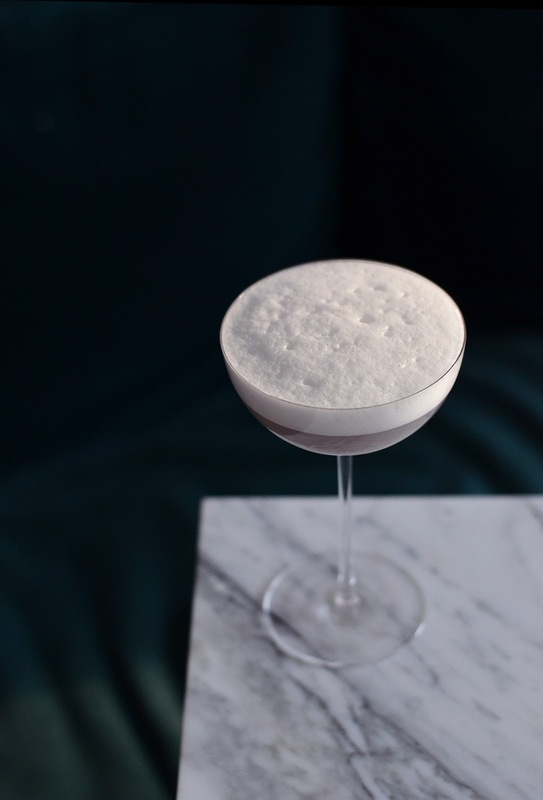 The difficultly, I soon discovered, of making cocktails with for real egg whites and not Egg Beaters was that getting a nice thick layer of foam was a lot more work. The first cocktail I made the traditional way: put all the ingredients in a shaker, add ice, shake, strain into a glass. I shook it for about 45 seconds, which I feel is the longest you can shake a drink without it getting ridiculously watered down. Still, the flavors felt a little weak. And although the egg white gave the drink a nice mouthfeel, the layer of foam that I created was unremarkable. But what could I do? Shaking the drink longer would just dilute the flavors even more. This is a Blue Moon cocktail, made with a dry shake. Fortunately, bartenders have developed techniques for getting around this. One is called the dry shake. For a dry shake, you combine all the drink's ingredients in a shaker, without ice, and shake them for about a minute. (This may seem like a really long time, but it's necessary to get a nice, dense froth from your egg white.) THEN you add ice to the shaker, shake as your normally would, and strain into a glass. The reverse dry shake produces a stiff, dense foam. Then there's a third way of shaking an egg white drink that some bartenders favor, called the reverse dry shake. For a reverse dry shake, you add all the ingredients to a shaker, with the exception of the egg white. Then you add ice and shake as you normally would. After that, you strain the cocktail into a different shaker glass, add the egg, and shake for a minute. The coupe glass in the front has an egg white cocktail shaken the traditional way. On the left is the reverse dry shake drink: dry shake on the right. Each of these three techniques produces a remarkably different drink. 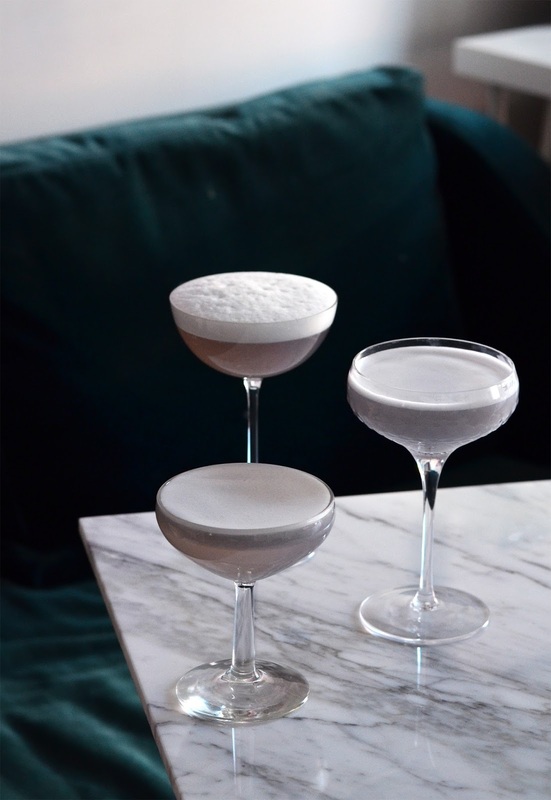 As noted before, the egg white cocktail shaken the traditional way tastes just fine, but its looks aren't anything to write home about. The dry shake produces a drink with a rich, creamy opalescence, almost like milk. Within a few minutes it settles into two layers: foam on the top, opaque, creamy cocktail below. 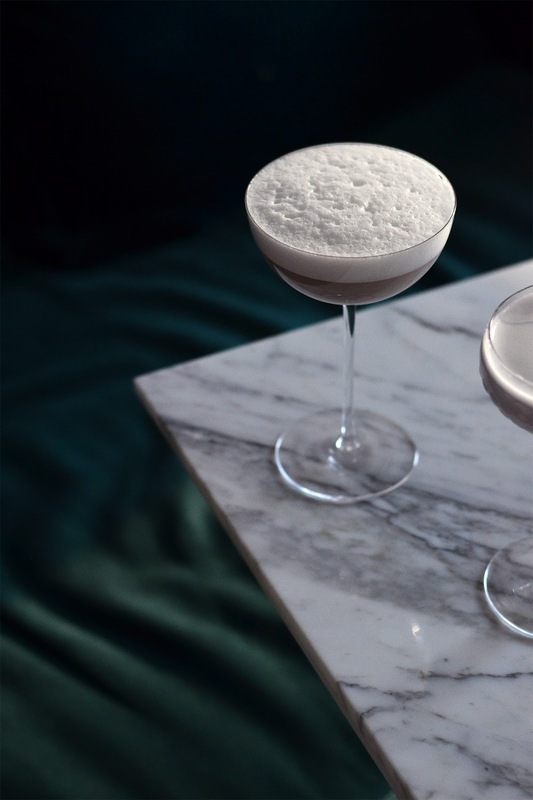 The reverse dry shake produces by far the most striking drink, with a layer of foam so dense you could rest a quarter on it. The foam is fluffy and thick, and particularly distinct from the drink below. This is, presumably, what all those folks on Instagram are doing to get that big, dramatic layer of foam. The only thing I don't love about the reverse dry shake cocktail is the experience of drinking it, which feels almost like drinking a normal Blue Moon through a nest of foam. So, unless I'm trying to impress people on the 'gram, I'll stick to making my cocktails with the plain old dry shake technique. But don't let that keep you from trying them all. Here are three ways to make a classic Blue Moon cocktail with egg. The Blue Moon is a sort of cousin to the Aviation, another favorite drink of mine, although the Blue Moon is a bit more violette-forward, which I don't mind at all. But one difficulty of all the shaking and re-shaking is the fact that if you shake violette too much, it turns from a nice pretty purple into an unappealing shade of grey. (This helps explain why a good Aviation cocktail is a bluish-grey, rather than bright purple.) This is why, in the drinks that call for double shaking, I recommend adding the Violette on the second pass. It's also why, when you look at the photo of the three drinks together, you'll see that besides having different densities of foam they're also all slightly different colors. Science is fun! It's also delicious. Combine all ingredients in a shaker. Add ice, and shake for 45 seconds (or a minute, if you're really comitted) and then strain into a glass. Same ingredients as before. Add all the ingredients, except the violette, to a cocktail shaker and shake for a full minute. THEN add the ice and violette to the shaker and shake as you normally would. Strain into a glass. Add the gin and lemon juice to a shaker. Add ice, shake and strain into another cocktail shaker. THEN add the violette, and the egg white, and shake (sans ice) for another minute. A good whiskey sour is like an old friend. Even when you haven't had one in a while, it welcomes you with open arms. There's something about that combination of the sour, and the sweet, and the kick from the alcohol that gets me every time. So when I picked up a bottle of spicy maple syrup at the farmers market, I already had a good idea of what I was going to do with it. The Deep Mountain Maple farm is located just outside of West Glover, Vermont, a little town about half an hour from the Canadian border. 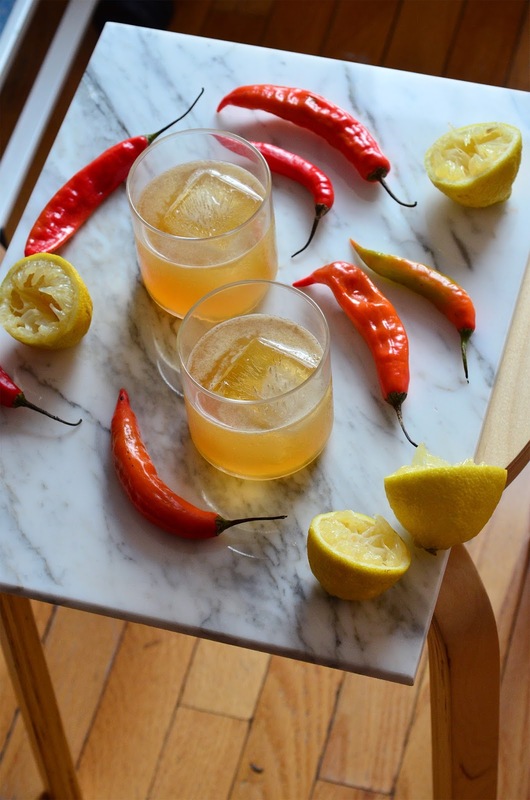 On the day I found them at the Union Square farmers market, they had a maple syrup infused with hot peppers, perfect for adding a little extra something to a whiskey sour. 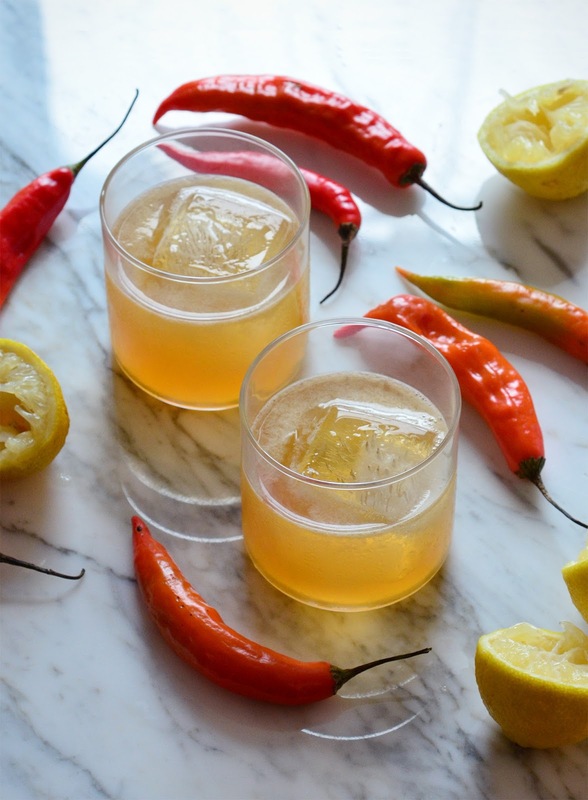 This one is bright and boozy, exactly as you like it, with just a hint of heat. Add all ingredients in a cocktail shaker. Add ice, shake, and strain into a glass. Drink deeply and dream of summer. Here's a Little Something to Keep You Warm. Eight years ago I visited New York for the first time, and the first bar I ever went to in the city was a little underground cocktail joint called PDT. The first drink I ordered there was something so weird and exotic I could barely wrap my mind around it - an old fashioned made with bacon infused bourbon. Yes, you read that right. Bacon. 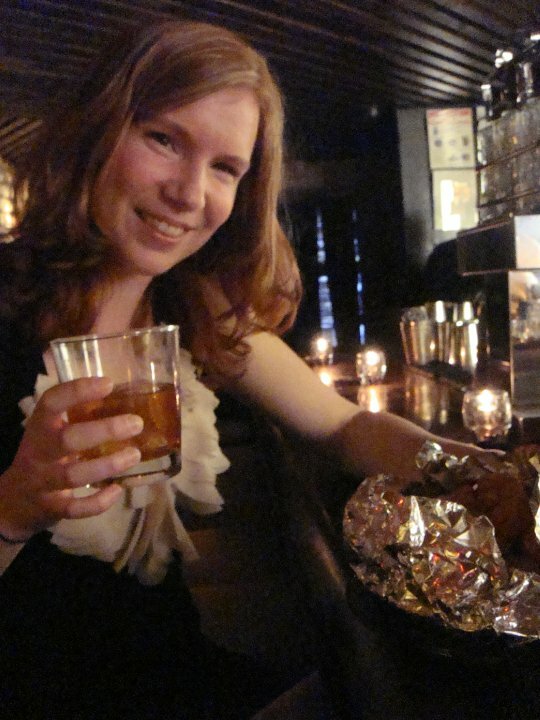 Here I am, circa 2010, enjoying a bacon old fashioned and some tater tots. The Benton’s Old Fashioned, made with orange, maple syrup, bitters, and bacon-infused bourbon, is a really interesting drink, and it’s not just gimmicky - it actually tastes good. Drinking meat seems fairly horrifying, but somehow the addition of bacon gives the old fashioned a smokiness and robustness you never knew it needed. The Benton’s is a staple of the PDT cocktail menu, and it’s one of their most ordered drinks. While hunkered down during our recent cyclone, I had the idea to make some bacon infused bourbon. And then I had the idea to turn the Benton’s Old Fashioned into a hot toddy, because it is punishingly cold outside and why not? I was a bit worried that bacon in a hot drink would just be incredibly strange, but I shouldn’t have been: my bacon hot toddy was only a little odd, a pleasantly surprising kind of odd. It's warm and full, with a subtle smokiness that resolves itself into a round sweetness. This weird little toddy is the perfect sort of thing for drinking around a campfire, or just in your tiny apartment when the weather outside gets to be too damn much. 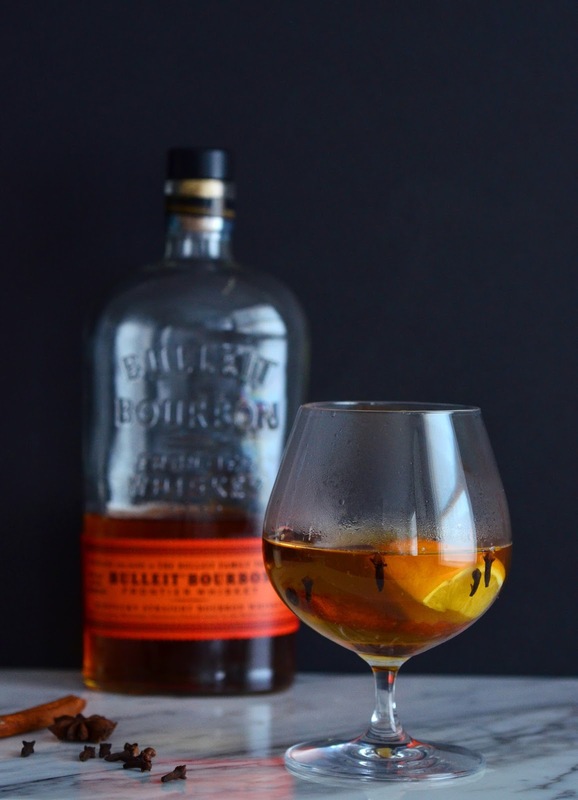 Combine the bourbon, maple syrup, and spices in a mug or heat-proof snifter. Add the boiling water: squeeze the orange slice (but not too much, or it'll get all pulpy) and drop it in. Those of you who know me know that I am not much of a cook, but still, I take a lot of inspiration from the culinary world. Some people, I imagine, have a sixth sense for flavor pairings, but I am always looking for clues. 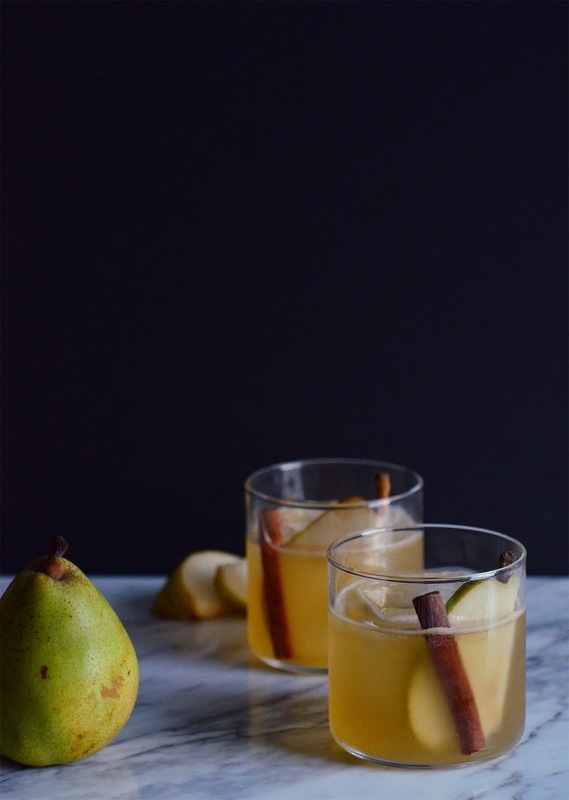 I had been wanting to make a pear cocktail, because I have a weird affinity for pear brandy, and at the farmer’s market I spotted a pear butter flavored with almond and cardamom, which was all the inspiration I needed to get started. 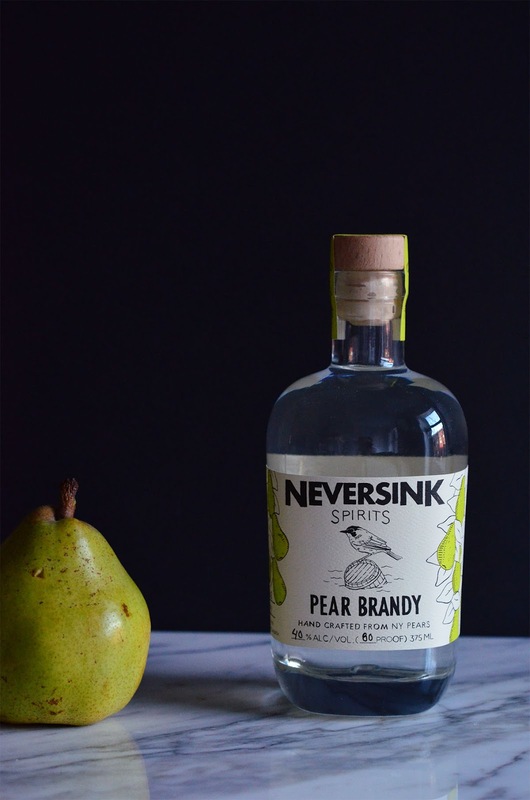 I knew that pear and bourbon were a good match, thanks to this pear old fashioned I made years ago (from Danny Meyer's Mix Shake Stir). So you have bourbon, and pear brandy, or eau de vie (a liquor distilled from pears), and also orgeat, an almond syrup frequently seen in tiki drinks, and cardamom bitters and a bit of lime. It all comes together beautifully, as if all these flavors were meant to be together, which, of course, they were. Combine all the ingredients in a shaker with ice, and shake and strain into a glass. 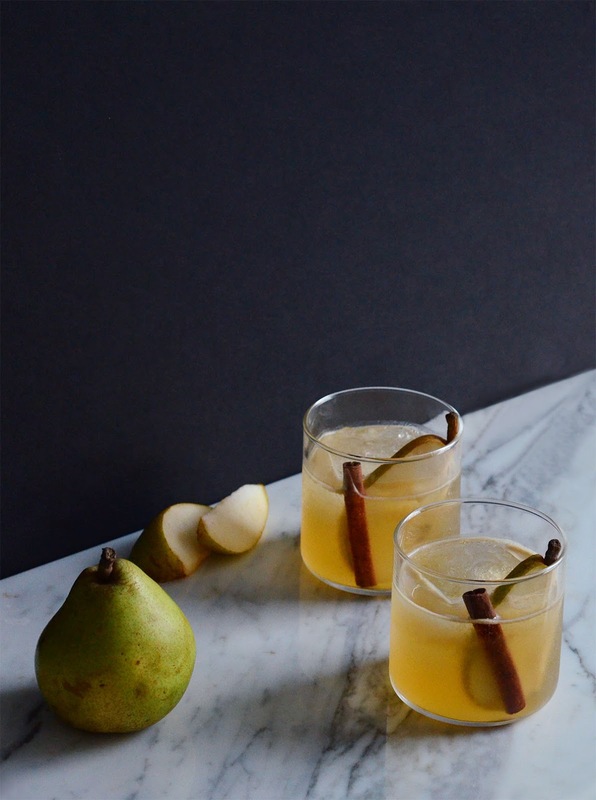 Garnish with a slice of pear and a cinnamon stick if you're feeling fancy - or just drink it down. Hi everyone. It's been a while. Sometimes life happens to you, and then you don't update your blog in three years. I've been busy, making the move from Texas to New York and creating lots of great content for Apartment Therapy. But it's good to be back. Last Saturday I wandered around the farmers market, looking for something to liquify, and I had that feeling of pleasure and deep rightness that you get when returning to something that you really love. 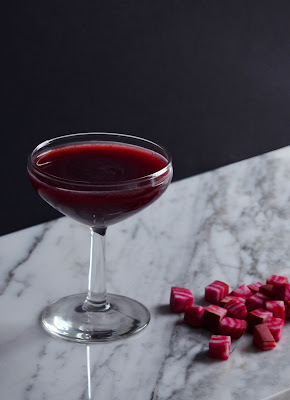 I bypassed lots of decorative gourds and settled on some beets, because I remembered having seen a beet cocktail once in a book of seasonal drinks. And because I didn't feel like juicing a pumpkin. Juicing beets, it turns out, is quite an ordeal. The pumpkin might've been easier. Right away, I cut into my beets and was horrified to discover that they were not bright pink on the inside, but rather pink and white striped. I began to panic, thinking I had accidentally bought radishes. A little research revealed that my beets were actually chioggia beets, an heirloom variety from Italy. Sources vary as to whether chioggia beets taste the same as other beets, or a little bit sweeter. I had nothing to compare them to, having never eaten raw beets before, and I thought they tasted like a carrot that's been rolled in dirt. 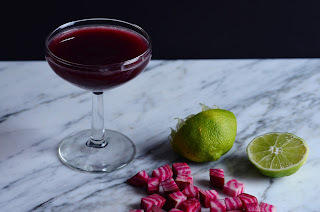 Cooked beets, of course, are much sweeter, but I couldn't help thinking that that earthy, rooty flavor would be a nice match for something else that's a little earthy and vegetal: tequila. Pair raw beet juice with tequila, lime, and ginger liqueur, and you get all the brightness of a margarita, but with a touch of dirt, like the raw, rich smell of a chilly winter hike. *After considering many puns about beets, I went for the most obvious. Have other suggestions? Leave them for me in the comments! Disturbing Movie Inspires Delicious Drink. Did you ever watch the original Willy Wonka as a kid? I did, and I was terrified. Of course there's plenty to be creeped out by in a movie about a vindictive candymaker who preys on misbehaving children, but the one scene that really gave me the willies was the one where Violet Beauregarde turns into a giant blueberry. That, my friends, is the stuff of nightmares. And also, it turns out, delicious cocktails. Because somewhere along the line, I had the idea to make a cocktail in honor of poor Violet, with creme de violette and, of course, blueberries. And as luck would have it, blueberries and violet are actually really, really good together. 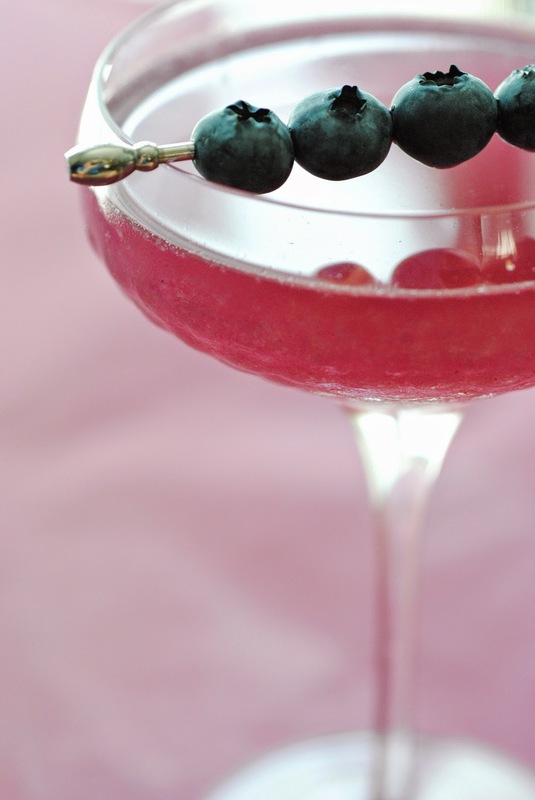 I started out mixing the blueberries and violette with rum, but I didn't quite like how that turned out, so I switched to gin, which was better, and a natural choice because gin and floral flavors are always a good pair. And then I tried it with Cointreau, which was a bit much, and sugar syrup, which was a bit eh, and then with maraschino, which was just right. It was only after I'd done all this work that i suddenly realized: "wait... this is just an aviation with blueberries in it." Oh well. is pretty good. 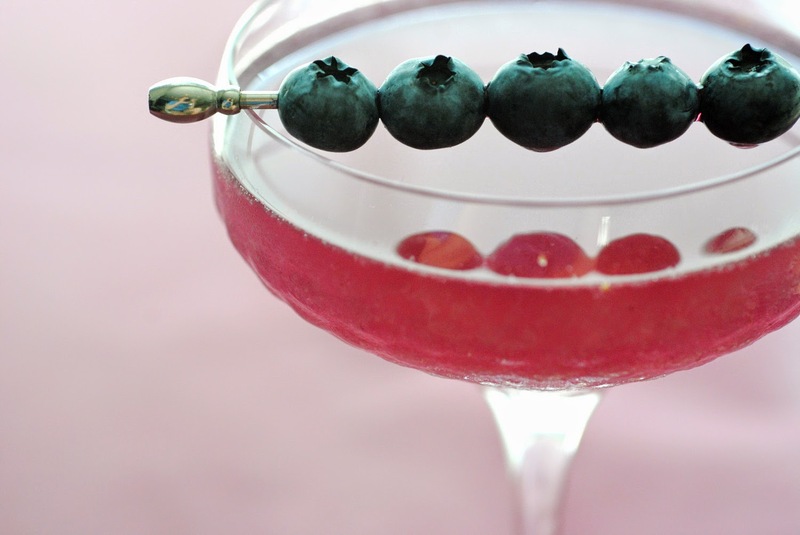 Here's how you do: place the blueberries in the mixing glass of your shaker, and cover with the lemon juice. Muddle gently until the lemon juice turns a nice dark pink. (Don't go too crazy with this: there is no need to smoosh the blueberries all up, just get the juice out.) Add all the other ingredients, and ice, shake shake shake and then double strain (you'll definitely want to double strain this one, to get out all those floating blueberry bits) into a glass befitting the loveliness of this lovely drink. Okay, it's more than pretty good. It's really really good. Every time I make this drink I remember again how obsessed I am with it. Jonathan, my erstwhile drinking buddy and taste tester, had one and even said it was better than a plain aviation. And that's high praise, because the aviation is a damn good drink. 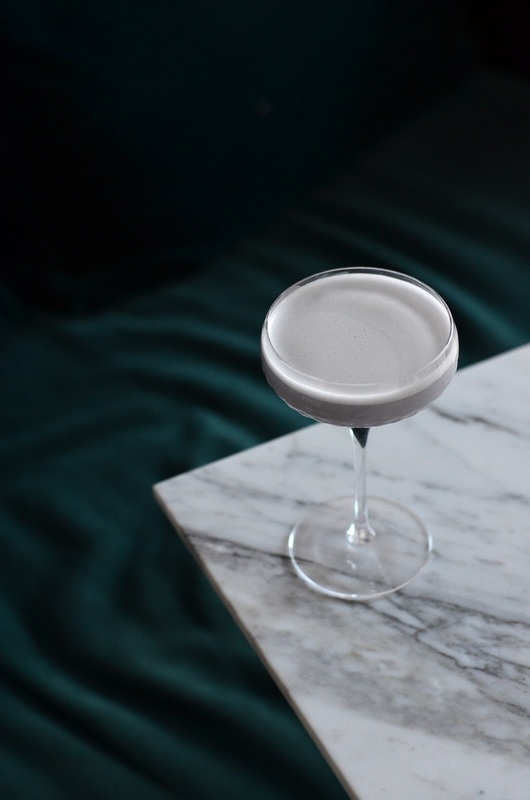 In this one, the violette is a bit more forward (which is appropriate, considering the name), but the flavors still blend together quite beautifully. It's my platonic ideal of a cocktail: lots of interesting flavors come together to make something smooth and highly drinkable. The sort of thing where you could take a sip and be like, ooh, violette! ooh, gin!, &c &c, or you could just plunk yourself on the couch and I dunno, watch game of thrones and sip one of these puppies and drink yourself into a happy stupor. Hunting down the violette may prove to be a bit of a chore, but it's worth it, I promise you. It's worth it.